1 Rinse fish fillets and pat dry with paper towels. Cut into 1 cm (approximately 1/2 inch) cubes. Place fish cubes in a bowl and season with salt and pepper. 2 Rinse limes and wipe dry. Finely grate and reserve the colored rind of 3 limes. 3 Halve and juice the limes. Pour juice over fish, cover and allow to marinate in the refrigerator for 2 hours, occasionally tossing the fish in the juice mixture. 4 Trim and rinse chile peppers, halve lengthwise, remove seeds and chop finely. 5 Rinse scallions, pat dry and chop into thin rings. Combine with chopped chile peppers, grated lime peel and oil. 6 Drain fish cubes in a sieve and thoroughly toss to coat with chile-lime oil. Season with salt and pepper. 7 Rinse cilantro, pat dry and chop leaves coarsely. 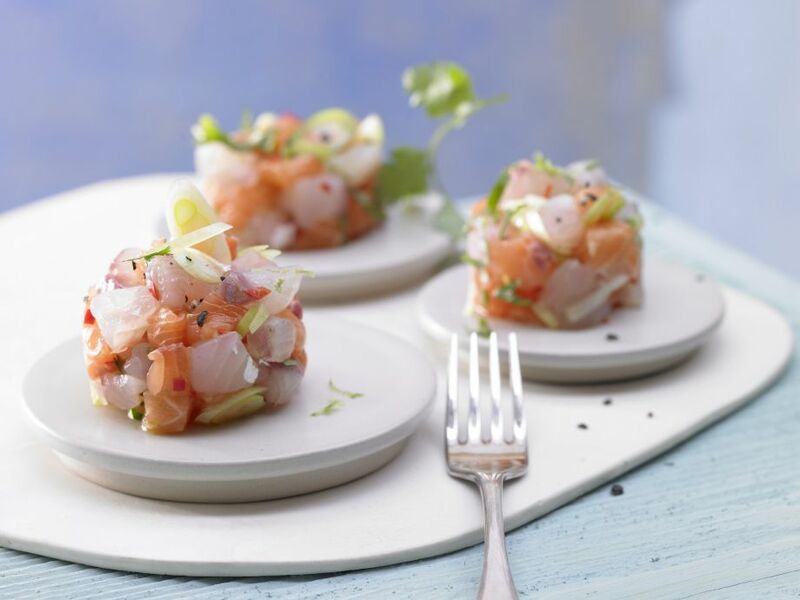 Sprinkle over fish tartare and serve.